Addis dropped away from view, a grey wound on the undulating landscape. The surrounding fields and forests emerged like the designs of stained glass windows in every shade of green. She had no idea her country looked like this, so beautiful, everything so small. She could hardly believe that their lives – covering the land with crops, living on the fringes of forests, all their struggles – could appear so silent and serene. She saw rivers cut into the land, deep gorges crackling out from the vast Lake Tana. Sunlight glinted off water, off the tiny silver specks of corrugated iron roofs. Every contour of the land was covered in the green velvet of vegetation. Had she ever seen such a luxurious thing? Soon the land fell away into low browns of dust and desert as the high shelf of western Ethiopia gave way to the desolation of Sudan. She wept. She had had no idea what she was leaving. She looked around the cabin for some way back, someone she could tell about the mistake she had made. But there was only the huge Nigerian woman next to her – already asleep – and the binding tightness of the seat belt across her hips. Only the constant droning of the engines hinted at the progress of the journey. Hours of flying over the dull grey blue of the Atlantic, with no physical landmarks, no solid ground to offer perspective only heightened her sense of isolation, dislocation. Although hundreds of Africans surrounded her – Ethiopians, Somalis, Sudanese, Eritreans, Nigerians – accompanied her to the faraway land of America, she could not imagine their stories. The man who had been invited to an Islamic conference in Ohio, the woman visiting cousins in New York who planned to request political asylum, the young woman with dreams of supermodel fame, the stately gentleman returning to his Colonial three bedroom in Connecticut after a depressing visit back to his motherland, the man in jeans with a forged Somali passport stiff in his back pocket were all worlds apart from her. Even more distant were the couple of faranjis sitting among the Africans, haggard and resigned in their minority status, confident they were returning to their own people after tours of duty in Africa; Africa is what they would call it in America; for ‘Africa’ conjured up the outline of a great dark continent, so much more easily understood than ‘Ethiopia’ or ‘Sudan’– specific places with histories and cultures that no one back home knew or cared about anyway. Zahara carried on an elaborate rhetorical conversation with her father, who now seemed closer, as the distance increased. She – speeding through the stratosphere, he – moving only microscopically, his individual molecules decomposing to animate the myriad flora and fauna of Chochotte’s soil. She wondered for the first time if he had been afraid to leave Addis Ababa, or rather, if he had been afraid of starting a new life in Chochotte. Fear is a useless emotion, he would have said, she imagined. But even after Mengistu’s regime fell, you didn’t return to Addis. Were you afraid of returning? Or afraid of leaving Chochotte? This, he declined to answer, or perhaps she refused to answer for him, to imagine him as a man with fears. You’re right Papa, fear is a useless emotion. Had he really said that? Maybe when she had crawled up to him at the crash of thunder, her tiny feet pressing against his upper thighs, or maybe when he had thrown her into the stream so she learned to swim with the boys. If not then, surely when he had taught her to catch horned beetles with her bare hands. Or maybe he had never said it, had only let the meaning hang between his inhalations. I was busy with my work; you were busy working with me, Zahara. A life of science requires stability, time to observe, to learn. The secrets of the world are not revealed in the blink of an eye, those who are busy travelling, those with unsettled lives only know the surface of things. Her knees knocked against the red and orange upholstery of the seat before her. She lifted her hips and set her legs at a new diagonal. But Papa, my life was unsettled by fate. She took up her own side. I have to move, I am doing what you said I should, I will become an educated woman. His approval – and only his – mattered to her, because she admired him, who he had been. Her desire, simultaneously crushing and liberating, would never be satisfied. She could imagine his approval, but would always suffer from the shadow of doubt. She looked up at the projected map in the cabin that offered an imaginary arc of flight. They were close now. She looked around. At some point the passengers had been transformed. They no longer looked like the Somalis, Sudanese or fellow Ethiopians who had boarded with her. Now they were within the gravitational pull of America. Now their identities reflected the fashion of the ground beneath them, a hint of hip hop around the waist of jeans, a briefcase infused with suburban sturdiness. Headscarves disappeared. American names rolled off tongues. Whatever had bound them together, whatever common experience of Africa, of Addis Ababa that had been obvious twelve hours ago was now just vapor. It would evaporate when they walked off this plane and were absorbed into the America they imagined or knew, mythical or mundane. I'm excited to introduce Zahara, the heroine of Through These Veins. Zahara has agreed to answer some questions so we can get to know her a little better. I have dreamed to traveling to the Sahara desert, as I the desert and I share a name. You might recognize my name, Zahara, as similar to Sarah. Names change with travel, so do people. Now that I have traveled from my village in Ethiopia, to the capital of my country, to Washington D.C., the Sahara desert will not look the same to me as it once would have. I think Americans can travel so easily because every corner of the world seems to come to them through their televisions and computers. You can travel to a different country like you are changing your clothes. All you need to do is buy a ticket and you end up in a different place, as if you had shifted a ball beneath your feet with the flick of a toe. But for me, I feel every inch of distance from the place I have come. I feel the ache in my feet, in my bones, in my heart like I had walked each step myself. Perhaps if I were to visit the Sahara, the desert would wrap me in a warm blanket of sand and we would dream together like sisters. My father had a single hard covered book on the bookshelf in our gojo – our home. This was the book he took from his pharmacy before he fled from the capital to our village when the socialist government took over. For a long time that was the only book that influenced my life, even though I didn’t understand most of it, could read only some of the words. But that book listed all of the western medicines and their uses. Of course we didn’t have access to those medicines, but my father used the book as a place to store all of his notes about the plant medicines we did have in our village. So for as long as I could remember, I knew that my father’s life and my life were about illness and healing. As a child I felt proud to have that book in our gojo. Now that I am studying at an American university and see thousands and thousands of books in the research library, I understand just how poor we were. I am Ethiopian, so of course my favorite food is injeera, the sour pancakes on which we place all of our food. I love it with lamb stew and a pile of red chili powder. Now that I am in the west, I have seen some of these beautiful actresses in films. I admire women like Angelina Jolie and Meryl Streep, but they are so much older than my age, and of course they are white American women. If someone were to play me in a movie (American friends have told me the story of my life is very cinematic), I actually wish the actress would be an Ethiopian woman. The look of an Ethiopian woman is very distinctive, with copper skin and almond shaped eyes. She should not be a woman from just anywhere in Africa, but someone who knows what it means to grow up eating injeera, smelling the coffee brewing, hearing the beats of our music. You just won a huge lottery what is the first thing you'll buy? I sometimes imagine returning to my village and paying for a well with an electric pump, or bringing electricity to every gojo, or even a library. But the things that I really long for, my father, the forest, my past, are beyond the reach of money. My father always told me, to whom much is given, from whom much is expected. We did not have much in the way of material things when I was a child, but the medicine and the knowledge God gave us are powerful indeed. And for that richness, I owe the world much. Anne Marie Ruff has reported on AIDS research, drug development, biodiversity conservation, and agriculture from Southeast Asia, the Middle East, and East Africa. Her work has been broadcast by National Public Radio, Public Radio International, the British Broadcasting Corporation, and PBS TV. Her articles have appeared in Time, Christian Science Monitor, and Saveur among other publications. 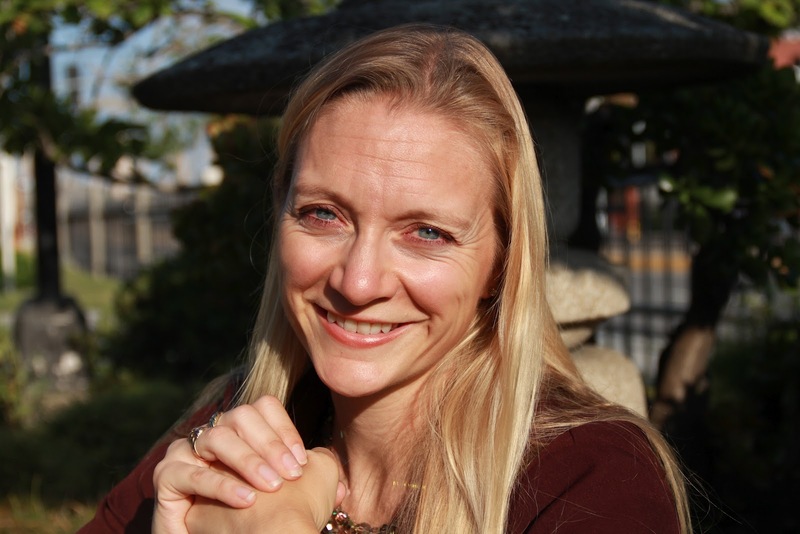 A Minnesota native, Ms. Ruff lives in Los Angeles with her husband and their two sons. Through These Veins is her first novel. 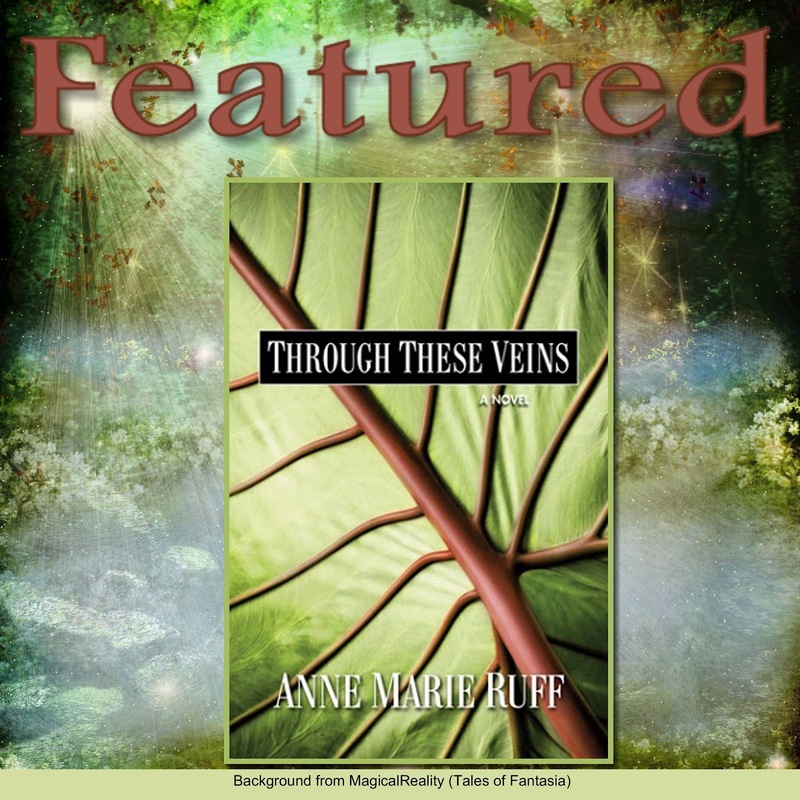 Enter to win choice of a Print or PDF copy of Through These Veins. Print option is available for US/CAN shipping only. Comment on this post for a bonus entry. Like Through These Veins on Facebook for another bonus entry. Giveaway ends Sept 1 11:59PM Central Time. Thank you for the introduction to this wonderful sounding book and its author. And thank you for the great giveaway. Sounds like a very interesting and informative book, which would open my eyes to related issues. Great blurb, great interview, fabulous plot. Thank you very much for the giveaway! The book sounds very interesting. I would really enjoy this book - I have worked in STD and HIV prevention for 20 years!